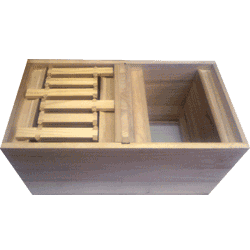 National 2 in 1 Nucleus Box ® , Standard Deep with Divider and Entrance holes at both ends. Use them without the Divider to hold 6 Standard Deep Hoffman frames. The Triplefold Frames are available as an option, they are not included. 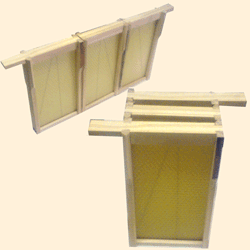 Put two or more Triplefold frames into the brood nest of a colony at the start of the season. These will then be filled with brood and stores ready to use when the swarming and queen rearing season starts. 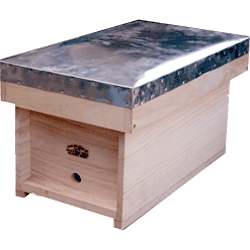 This makes populating the hive with the minimum of bees very easy for the beekeeper and the bees. Designed to be simple and light weight so they are easy to carry and transport. The bottom of the box is meshed so it is suitably ventilated. 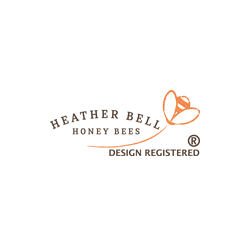 With many uses for queen mating and introduction and for collecting and transporting colonies and swarms. 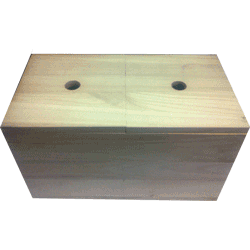 2 Piece Crownboard with feed holes. Hive body incorporating Stainless Steel Floor Mesh and Floor Runners. A natural weather proofing of Linseed Oil & Beeswax is recommended to keep hives dry. This can be supplied filled with 4 Hoffman Triplefold Frames assembled and fitted with wired wax foundation. A Feeder Eke to fit the 4 Pint Top Feeder can be added.